There are times when I am invited to various events and tastings. I have to admit that I'm very lucky to be considered since I don't take myself too seriously. Actually, I don't think any my friends take me very seriously. Maybe that's why they ignore me... Anyways, it's good that some people think of me and invite me to events. 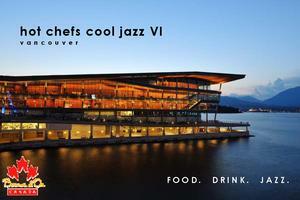 Tonight, along with Melody, Darina, Victoria, Joyce and Mr., we attended the Hot Chefs Cool Jazz event at the Vancouver Convention Centre. 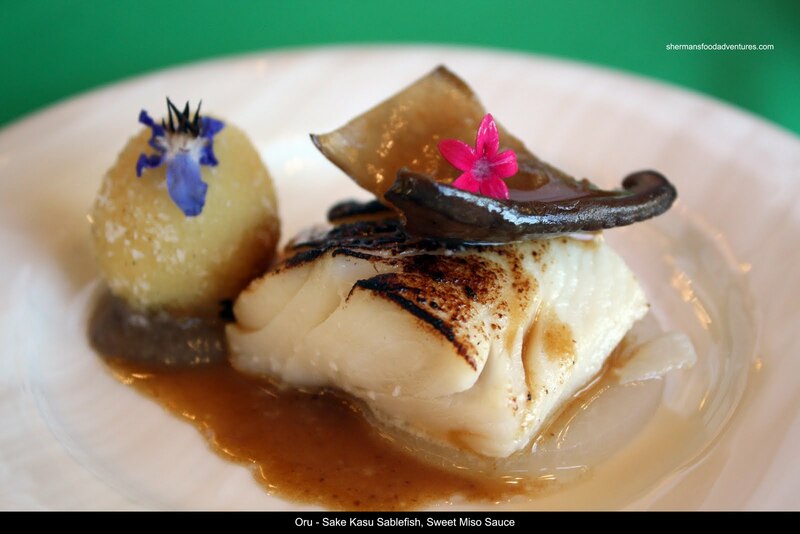 The event was put together as a fundraiser for Team Canada's entry into the Bocuse d'Or competition. 24 countries will be represented in Lyon, France in January 2011. The Bocuse d'Or is often considered the culinary Olympics and is arguably the most prestigious cooking competitions in the world. 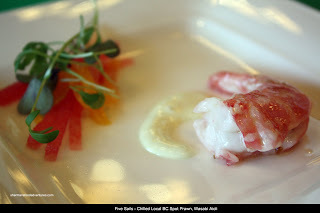 Ryan Stone, Executive Chef at the West Coast Fishing Club on British Columbia's Haida Gwaii, was selected in 2008 to head the Canadian contingent at the Bocuse d'Or. As part of the media, we were treated to delicious gastronomical delights from 30 of the best restaurants in Vancouver. The evening's focus was not only on the food. Rather, there were intentional wine pairing s for each and every item offered. Wines were categorized as bubbles, crisp, fruity, luscious, juicy and bold (Svedka martinis were available as well). Wineries represented included Sumac Ridge Estate, Nk'Mip Cellars, Jackson-Triggs Okanagan Estate, See Ya Later Ranch, Inniskillin Okanagan and Osoyoos Larose. At every restaurant station, a placard described each food item as well as the associated wine pairing. At first, I attempted to hold onto my wine glass, camera and plate of food. Alas, it was an accident waiting to happen. Thus, I put my wine glass down and completely forgot about it. Well, it was all fo r the better, I was driving anyways. 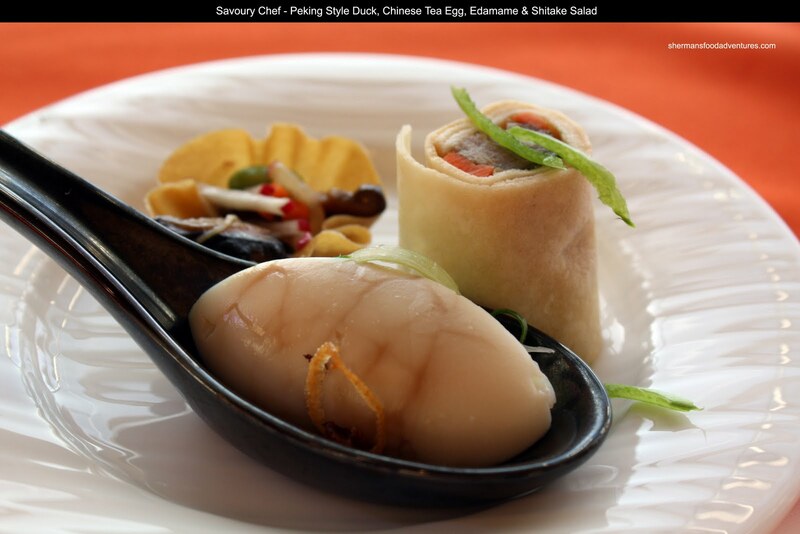 Before entering the main hall, we sampled some items from Savoury Chef, including Canapes - Peking Style Duck, Chinese Tea Egg, Edamame & Shiitake Salad and Macaroons. They were nice little bites and a good start to the endless eating. A simple and delicate Sake Kasu Sablefish with sweet miso sauce tickled my fancy at the Oru station. Slightly torched at the top, the fish was well-prepared (not mushy or overcooked), while the miso did not overwhelm. Right across was Araxi and its well-prepared BC Albacore Tuna with ponzu pears & cress. 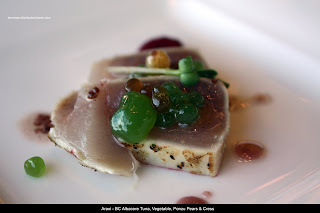 Beautifully presented, th e tuna was allowed to show it's natural flavours. From what I can gather, the ponzu appeared to be prepared with sodium alginate and then putting it in a calcium chloride bath (Molecular Gastronomy). At the Hapa Izakaya table, there were 2 treats for us to sample. The first was the Cold Sweet Soy Marinated Duck Breast with orange mustard miso. 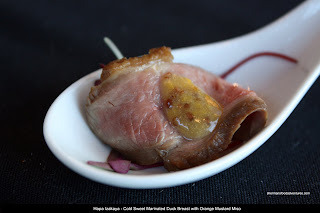 Served on a spoon, these one-bite morsels were tender, not overbearingly seasoned (thus a nice duck flavour) and beautifully complimented by the sweet mustard. The second item was probably my favourite of the evening. Surprising, considering the culinary heavyweights in attendance. 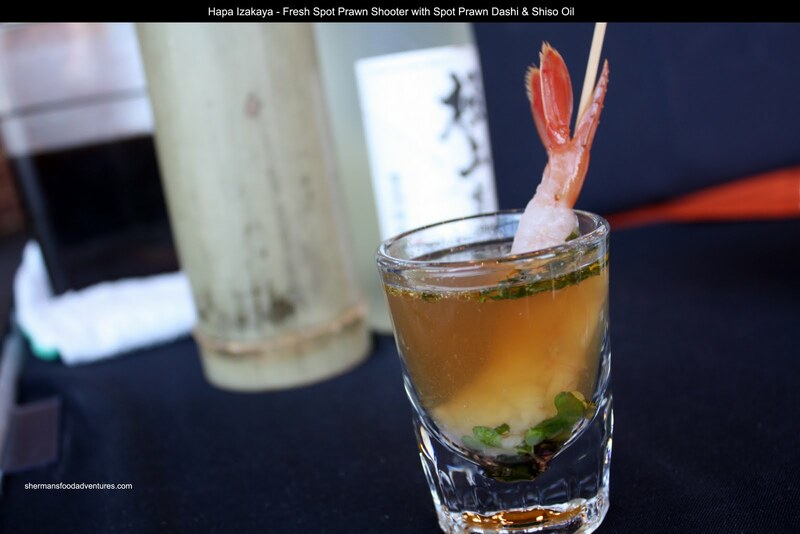 The Fresh Spot Prawn Shooter was something I knew I was going to enjoy before I even tried it. Merely a raw spot prawn on a skewer, it is placed into a shooter glass. Then hot spot prawn dashi (made from the shells) & shiso oil were poured into the glass. Thus, it "cooks" the prawn somewhat. Since spot prawn are so delicate, it is very easy to overcook them which results in a chewy product. In this case, the prawn is able to retain its natural sweetness and texture. A tad on the salty side, the prawn dashi exhibits the richness and depth of a bisque without the butter and cream. I loved it so much, I went back for another at the very end, even though I was stuffed beyond belief. Something that definitely caught my eye was the offering from CinCin. 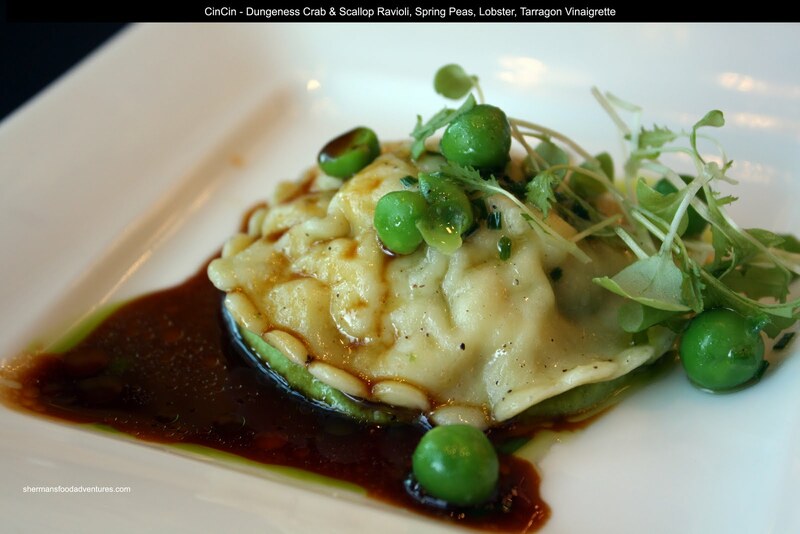 I'm sure most people would be attracted to the Dungeness Crab & Scallop Ravioli with spring peas and lobster tarragon vinaigrette. 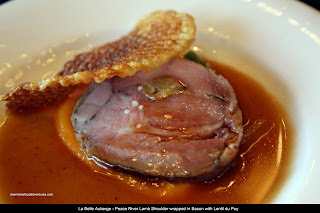 Not as fluffy as I would've like (probably due to the venue and its limitations), the dish as a whole was very good. Stuffed full of crab and scallop, the natural sweetness is all the raviol i need for flavour. The vinaigrette offered a slight acidity to the dish. Over at the Voya table, possibly the most visually stunning offering at the event was the Seafood Ceviche served in a seaweed cone. I'm actually quite happy with the photo, especially since I had to pose it in one hand and take the picture with the other. In enjoyed the cone very much. 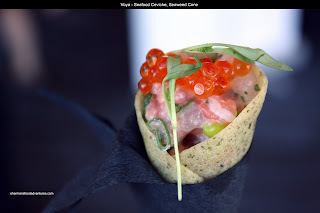 The ingredients were fresh, the flavours were clean and the cone retained its crispness despite the filling. Another favourite of the night had to have been the Peace River Lamb Shoulder wrapped in bacon with lentil du puy from La Belle Auberge. The lamb was super tender and the fully cooked piece of garlic help give a boost of flavour. A sprinkle of sea salt and bacon provided all the seasoning the lamb needed. I ate it so fast that I didn't really notice the lentils underneath nor the demi-glace. The last item that I will talk about is the offering from Five Sails. Simply a Chilled Local Spot Prawn with wasabi aioli, it was clean and delicious. I believe the prawn was poached and just barely cooked. The natural sweetness was not hindered by anything on the plate. Rather, the wasabi aioli was quite understated and did not overshadow the prawn. Honestly, there was so much to sample that we were full halfway through. I made it a point to try everything else and I was busting at the seams. Yes, when I saw all the delicious food, I said "Wow" too. Oh, c'mon, dude, take some credit. The shots look good! Now, the loaded question: was it a formal event where you were required to wear suit? If that is the case, I am glad I declined the invite! Yes, it was suit and tie. It was okay, I ate lots. Hehe. I am someone who can never make up her mind about what to order, so being able to sample so many different things is my idea of heaven. Lucky you! Your pictures look great too. Thanks Donna! Yah, I'm very lucky to be part of the event! Darina, if you can take pictures as well as you write, I'm sure the pictures will be awesome! sounds (and looks) delicious! 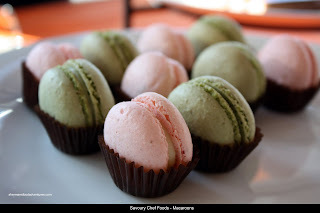 how were the macarons? were the green ones green tea flavoured? Sherman - it was nice seeing you at the event too! I'm glad you enjoyed the event as much as I did! LPV, my pictures will never be as good as yours!